The celebration of fourth centenary year of Mahamati Prannath is going to begin very soon. This gives us an opportunity to communicate his messages, far and wide. 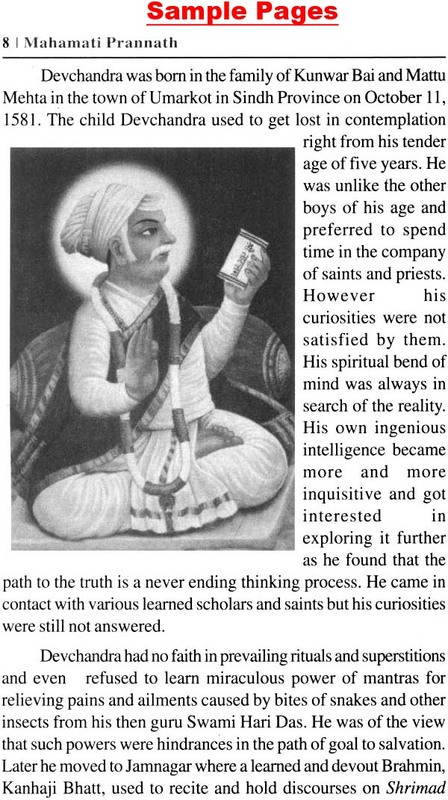 He bestowed his real time qualified religious philosophy based upon elevated thinking to the masses which were submerged in routine ritualistic affairs. Today, even after 400 years, his teachings are equally valuable and useful for the society which has been divided in the name of religion into various faiths and creeds. He delivered the know ledge of worshipping one Almighty. His message was-God is one and religion is also one. Thereby he directed the society to follow one universal religion in order to promote amicable relations among all. He started his soul awakening journey from Jamnagar and travelled to many parts of India and also to Gulf countries to convey his messages of true religious faith and unity of religions. Finally he settled at Panna, in Central India, where most of his incarnated knowledge was revealed. 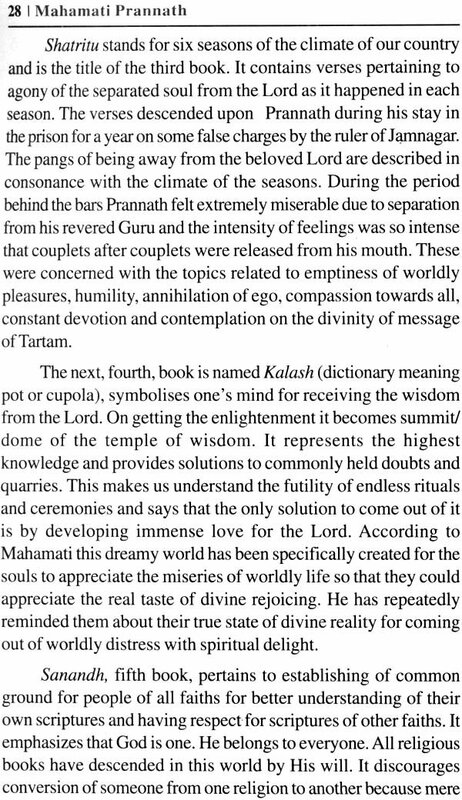 Mahamati Prannath was a saintly philosopher. He was actively engaged in religious and social activities. It was during the period of Mughal Emperor Aurangzeb. Mahamati was the guru of Maharaja Chhatarsal of Bundelkhand, and had the status similar to that of Guru Ram Das of Shivaji in Maharashtra. He was not only the religious guru of Chhatarsal but he guided him in political, social and economic affairs too. It is believed that it was the boon of finding diamonds in Panna by Mahamati Prannath which made Maharaja Chhatarsal prosperous enough for battling against the hostilities of Mughal forces. It is also well known now that Mahatma Gandhi and Rani Lakshmi Bai of Jhansi were highly influenced by his preaching. Mahamati Prannath and his guru Devchandra laid the foundation of Pranami Faith which has followers all over India and in several countries abroad. 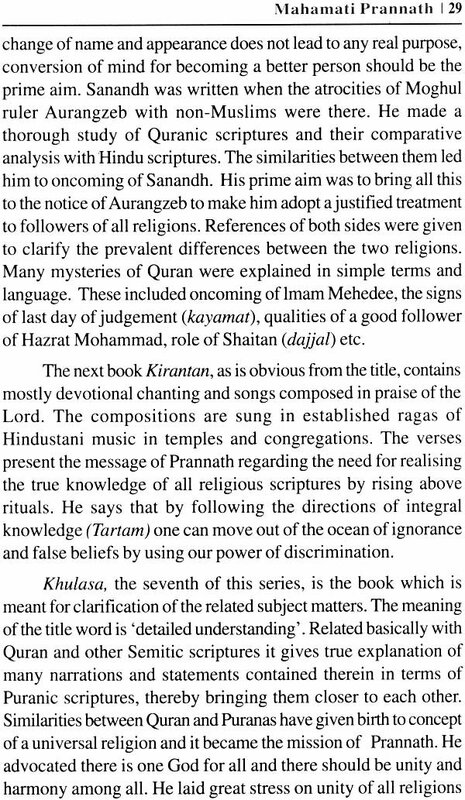 The Holy Scripture 'Kuljam Sarup' (also known as Tartam Vani), comprising of 18758 verses compiled in 14 books, was the outcome of his spiritual wisdom. Besides spirituality he has also dealt with many subjects related to social upliftment. 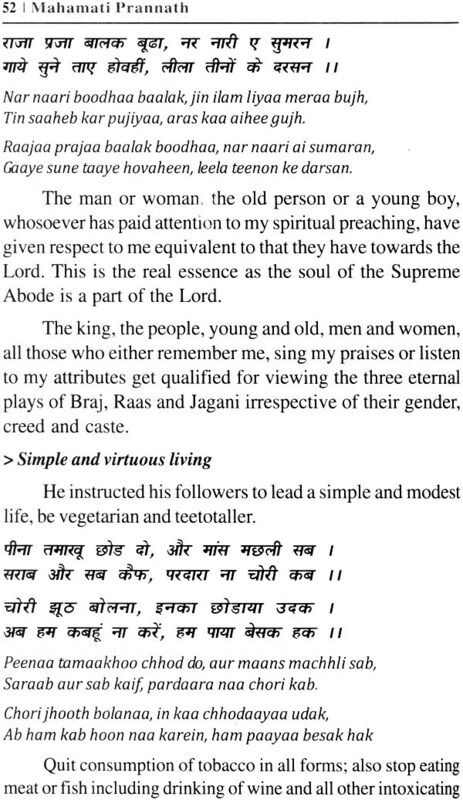 His preaching, based on both Vedas and Kateb scriptures, has emphasized the similarity between all religions. This present booklet presents a brief introduction to his life and messages for ushering peace and amity among followers of all religions. Some of his contributions in the field of social reforms have also been highlighted. A few relevant verses have been cited to illustrate his edifications. Dr Pran Gilotra, a retired senior scientist, has made a very sincere effort to describe various aspects of the life of Mahamati Prannath, in this volume. MAHAMATI PRANNATH'S life and his message of universal peace and fellowship are of utmost importance in the present state of world which is continuously facing the worst form of moral and spiritual chaos. Mutual ill-will and distrust among the people at large, due to political as well as religious differences, has divided the humanity to such an extent that it is likely to lead to its destruction. His teachings have ongoing significance in the modern world as we see rift of narrow attachments in variety of faiths and cults. His entire life was devoted to promote synthesis among various spiritual and religious groups of that time which were giving rise to conflicts among the people and rulers belonging to different faiths. The countrymen were facing acts of atrocities and hardships due to limited understanding of the true teachings of the religious leaders and scriptures by the kings and monarchs of several regions in the country resulting in sufferings of the masses and battles among the rulers. Mahamati Prannath was contemporary of the Mughal King Aurangzeb. He gave new dimensions to the spiritual movement which is now named after him and is called Pranami Faith. At that time country was in a state of religious bigotry, Hindus being supressed ruthlessly by Aurangzeb. Prannath opposed the policies of the ruler and tried hard to tell the king about the necessity of harmony among followers of different religions. Prannath conceptualised the basis of a universal religion. His divine vision was that the whole world which is divided by multi-worshipping processes can be made better if all the people take the path of monotheism. The noble incarnations in the form of prophets possess the super intellect and subtle apprehensions; they are gifted with divine consciousness. Prannath stands as a unique example of such a messenger of the Lord Supreme whom He had bestowed with His bliss and manifestation of spiritual powers. The eternal knowledge of Mahamati Prannath is radiated to the human races through his fourteen books-together referred as Kuljam Swaroop (also known as Tartam Vani). It is taken as an ocean of divine knowledge by his followers. He teaches the humanity the true path of love and emphasizes the necessity of unifying the diverse modes of understanding the religious teachings thereby enabling all of us to have the integral view of reality. According to him-God is Love and Love is God. True happiness can come out of love only. With the remembrance of God the consciousness of devotion gets enhanced and to the same measure the spirit of godly love gets manifested in the devotee. Mahamati's efforts are directed towards making us aware of dreamy world of human misery so that while suffering from agony one may not try to escape from it in false hopes and dream for a brighter future. To get relieved from the repetition of the life of misery one should not remain blindfolded because this puts him back to experience it again and again. A complete understanding of the misery and its causes can be immensely helpful in getting liberation from the cycle of birth and death. When the intense suffering is converted into meditation, the related energy also gets transformed into higher consciousness. In this manner the soul purifies itself in the fire of love for the Supreme. The spiritual power of love ultimately triumphs and gets attached in the bliss of divine vision. He carried forward the message of amity and brotherhood in order to reconcile the divergent sections of the society. He was a true reformer who pleaded for a number of transformations for the upliftment of the moral as well as the in general character of the common masses. He firmly believed in equality and respect for all religions irrespective of caste, creed or customs. His famous saying- "Soi Khuda soi Brahma" speaks about his conviction concerning similarity and parity of the philosophy of all religions. In this context it may be mentioned that Mahatama Gandhi's famous devotional song "Ishwar Allah tero naam" had its origin from preaching of Mahamati Prannath. Gandhiji's mother belonged to Pranami faith and in their temple in the city of Porbandar both Geeta and Quran was recited together. This had deep and everlasting impression on the mind of the young boy Mohandas Karamchand Gandhi. 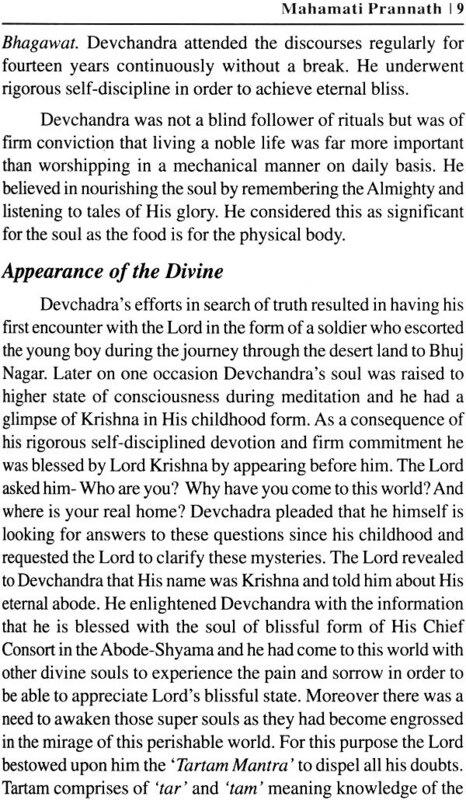 Throughout his life, in day to day preaching and writings, he has given all credit of all his activities to his master-Sadguru Devchandra, who led him to the path of spirituality and divinity. Both of them are considered as the founders of the Shree Krishna Pranami Faith, also called in brief as Pranami.